Applied science students Marlon Galea, Kazi Kannan, Ahmed Abdullah, Dale Spacey, Luca Decelis and Keylon Zammit moulding bone china paste into different shapes and figures, supervised by their teacher Martin Azzopardi. 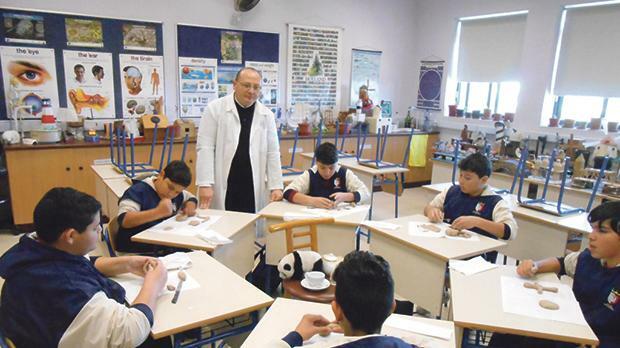 In the latest in a series of practical projects led by our science teacher Martin Azzopardi, applied science students at St Margaret College Senior Secondary School, Verdala, Cospicua, recently learnt all about porcelain and bone china. We were also given the opportunity to mould bone china paste into shapes and figures. We learnt that porcelain was invented in China during the Tang dynasty (AD618-907) by mixing kaolin (china clay) and pegmatite, a coarse type of granite. The first Chinese porcelain wares appeared in Europe in the Middle Ages and although Europeans tried for a long time to copy it they did not succeed. It was only in 1707 that two Germans – Ehrenfried Walter von Tschimhaus and Johann Friedrich Bottger – succeeded to imitate bone china by combining clay with ground feldspar. The first European hard-paste porcelain was produced in 1710 in Meissen, near Dresden, and Meissen Porcelain or Meissen China became one of the most famous porcelain manufacturers in the world. Later in the 18th century the English improved upon the German recipe for porcelain by adding ash from cattle bones to clay, feldspar and quartz. Whereas porcelain is translucent, bone china is opaque, softer and easier to cut, and is also fired at lower temperature. Although bone china is fired at lower temperatures than true porcelain, the bone ash enables it to become translucent. Because bone china is easier to make, harder to chip, and stronger than hard porcelain, it has become the most popular type of porcelain in the US and the UK. The authors are students atSt Margaret College Senior Secondary School, Verdala, Cospicua.